And she has no intention to stop until she reaches her goal. 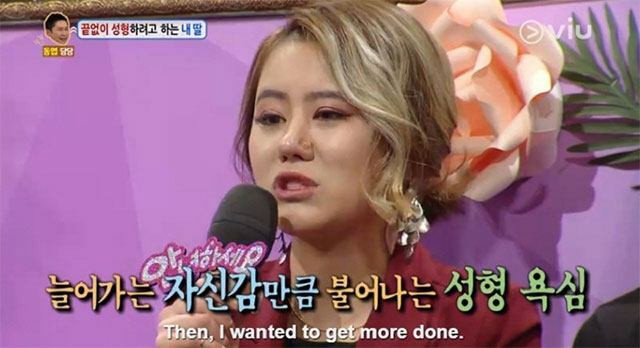 A desperate Korean mom sought the help of TV talk show counselors to put a stop to her 22-year-old daughter's addiction to plastic surgery. The Korean mom and her daughter appeared on Hello Counselor, a show where ordinary people share their problems and the hosts and guests give advice. Their issue was among the three being featured in the show's Episode 308, and their segment was titled "My Daughter is a Monster." The woman shared that her daughter started to be obsessed with plastic surgery when she was just 14 years old. The mom confessed that at that time, she indulged her daughter's plea to undergo double eyelid surgery to have more Western-looking eyes. This 22-year-old Korean woman started getting plastic surgery when she was 14 years old. She wants to eventually look like Kylie Jenner. The mom recalled that her daughter had told her, "Mom, I'll study hard if you get my eyelids done." But the double eyelid surgery only seemed to encourage the girl to get more plastic surgery. Since her mother no longer wanted to spend for more procedures, the girl started working at a fast food restaurant and saved more money for surgeries by walking home instead of taking the bus. Despite her mother's forceful objection, she still had a nose job and filler injections. The young woman revealed that she has no intention of stopping anytime soon. When the Hello Counselor hosts and guests asked her if there was a celebrity she wanted to look like, she replied, "I have much pride. There's none in Asia." She then added, "There’s a foreigner named Kylie Jenner. She has a hot figure and she looks exotic." By that, the young woman was implying that she wouldn't stop getting plastic surgery until she eventually looked similar to Kylie. Despite the Hello Counselor hosts and guests' advice for her to stop, the 22-year-old didn't seem convinced. She had pointed out that she enjoyed the attention given to her by people who thought she was pretty.